I have often been asked why certain products get the top score and get awarded the ‘Golden Beard Award’, the only way I have been able to describe it is it’s the groan factor! The Runesilk Revolution beard oil is one of those products, when you use it for the first time, you almost groan with pleasure. I knew quite early on when testing this oil that it would get the ‘Superior Product’ Golden Beard Award that is saved for the very best of the best. The scent is a blend of just three essential oils, Sandalwood, Bergamot and Black Pepper. But this is where you know that a high quality essential oil has been used. Like everything we can purchase, there are varying degrees of quality available and when it comes to essential oils, it is very noticable. I love the Black Pepper scent and yet in some products I have been disappointed in it, but definitely not here. The scent is warm and slightly spicy with a hint of citrus sweetness and smells almost like a cologne. It really is an incredible scent blend that even lasts on the beard, in fact I woke up and straight away got the scent of this oil. I favour beard balms but in an oil the scents are always fuller. The base for the Runesilk Revolution beard oil is a blend of Sweet Almond Oil, Hemp Seed Oil & Vitamin E.
Again you can feel the quality in the oils, it really is a beautiful beard oil. Runesilk are just starting out, they have a balm and now an oil but if this is an indication of the products yet to come, well Runesilk will be easily taking a slice of the beard care market. I was however quite suprised that it was a 30ml bottle, the Runesilk Revolution Beard Balm was a 100ml tin for £15 and I had thought they might follow that with a large oil. 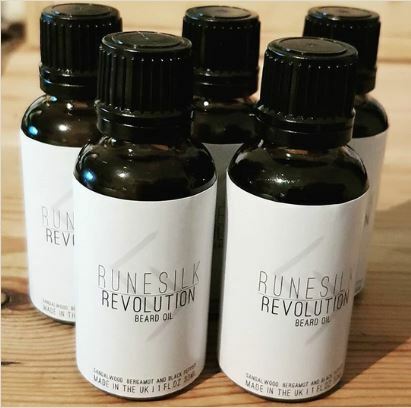 The Runesilk Revolution beard oil comes in a 30ml glass bottle with a dripper stopper and costs £11.99 from the website. a voucher for £1.99 off the 30ml if you like the oil.